New neuroimaging technique shows how the ‘social brain’ is impaired in autism. The brain controls most of a person’s behaviour and changes in how brain areas work and communicate with each other can alter this behaviour and lead to impairments associated with mental disorders. When researchers match neurobiological and neuroanatomical changes in the brain with behavioural impairment, they can start to understand the biological mechanisms of this disorder, which may help improve diagnosis, and, in time, treatment. Now, researchers from UCLA have found that brain areas linked to social behaviours are both underdeveloped and insufficiently networked in youths with high functioning autism spectrum disorder (ASD) compared to study participants without ASD. The team state that their findings provide insight into how the brains of children and adolescents with ASD might be organized differently than youths without the disorder advances the basic understanding of the ASD brain. The opensource study is published in the journal Brain and Behavior. Previous studies show that Autism spectrum disorders (ASD) are characterized by impairments in social communication, the presence of restricted interests and repetitive behaviours and/or sensory over-responsivity. During the past few decades, neuroimaging studies have provided new insights into the neurobiological underpinnings of these behavioural impairments and have revealed aberrant patterns of brain activity in virtually all nodes of the ‘social brain’ in ASD. In addition to altered activation patterns during tasks, changes in functional connectivity (FC) of several key resting brain networks have been identified. One major resting brain network, the default mode network (DMN) has become a focus of research, as it is relevant for self-referential thought, social and emotional processes, and theory of mind which is the ability to attribute mental states to one-self and to others. While conventional blood oxygenation level dependent task-related fMRI and resting-state functional MRI (rs-fMRI) are capable of identifying areas of altered task-activity and changes in FC of brain networks, respectively, these methods do not provide a measure of metabolic activity within these networks. 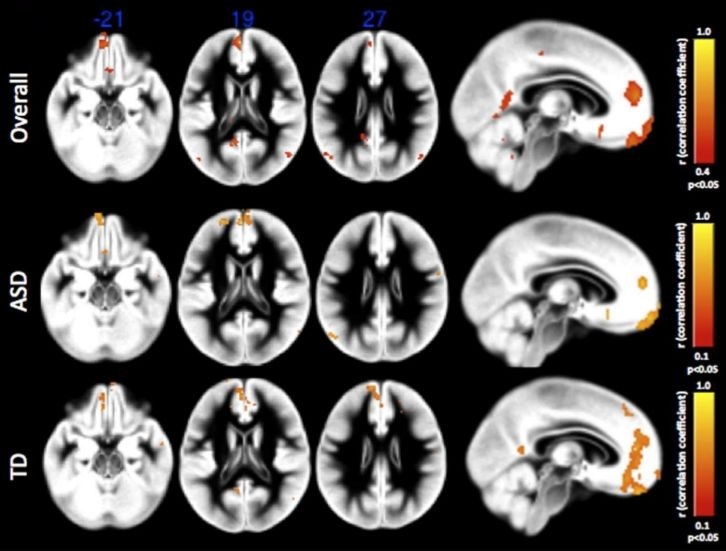 By using used imaging technology that tracks both brain blood flow, as a measure of energy use, and the organization and strength of connections within neural networks the currrent study was able to show that ASD might be caused by increased or decreased connectivity within specific neural networks that form the social brain. The current study performed neuroimaging on 17 youths with high-functioning ASD and 22 typically developing children and adolescents. The groups were matched by age, 7 to 17 years old, gender and IQ scores. Results show that imaging the participants while they rested in the scanners revealed significant differences between the two groups. Data findings show that children with ASD exhibited a pattern of widespread increased blood flow, or hyper-perfusion, linked to increased oxygen metabolism in frontal brain areas that are important in navigating social interactions. The lab explain that this is important because, as a brain develops, blood flow is generally reduced. They go on to add that these signs of continuing hyper-perfusion in ASD participants suggest delayed neurodevelopment in these frontal brain regions associated with socio-emotional cognition. They go on to add that this is consistent with structural MRI findings of enlarged brain size and an overabundance of neurons in ASD, due to the fact that the synapses of neurons have not been sufficiently ‘pruned’ as the brain develops, so too many functioning synapses inhibit cognition while requiring extra blood flow. The group state that to their knowledge this was the first time an MRI tool known as arterial spin labeling perfusion was used to study ASD, a technique which uses magnetically labeled blood water as a tracer to quantify brain blood flow. The researchers state that they also refined use of existing technology that assesses how well separate brain areas are functionally interconnected; both techniques are non-invasive, requiring no injections of radioactive tracers. Results also show that reduced long-range connectivity between default mode network nodes located in the front and back of the brain in those with ASD, compared to typical brains. The lab conclude that this loss of connectivity means that information cannot flow as it should between distant areas of the brain, which may help explain impairment in social responsiveness. The team surmise that the architecture of the brain follows a cost efficient wiring pattern that maximizes functionality with minimal energy consumption, and this is not what they found in ASD participants. For the future, the researchers state they will continue to study the relationship between network connectivity and metabolism in individuals with ASD, extending their work to other relevant brain networks. They’re also seeking to define the range of variation in these factors in the general population.